An online training module using “Edna”, a virtual elderly woman with chronic lower back pain as a case study, greatly improved medical student clinical skills. That’s the finding of a study done at the University of Pittsburgh and published in the May 2014 issue Journal of the American Geriatrics Society. The module is the first curriculum resource created through the efforts of the National Institutes of Health Pain Consortium’s Centers of Excellence in Pain Education program (CoEPEs). The program was developed in response to the Affordable Care Act’s mandate to advance the science, research, care and education of pain. One of the goals is to reduce patients’ reliance on opioids and other painkillers. The CoEPEs are creating and testing online, case-based pain education modules for use in their own teaching institutions. Edna and several other modules will be made available to other teaching institutions beginning in the fall of 2014 at NIH Pain Consortium. These modules are also accessible by the general public to help them learn how to discuss chronic pain with their doctors. 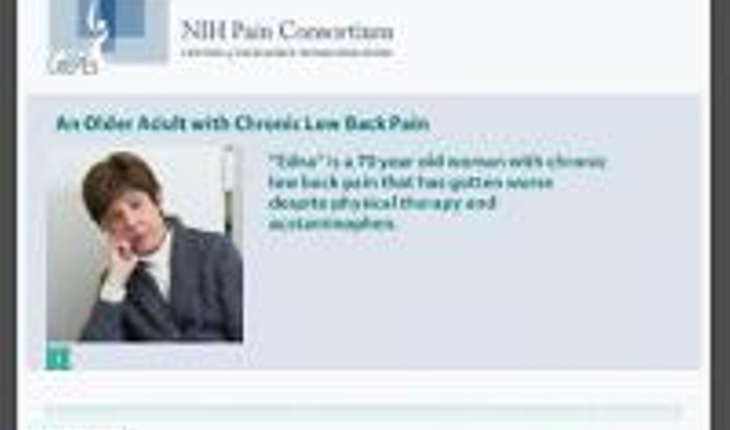 A preview of the module is available at An Older Adult With Chronic Low Back Pain. A team of six experts in education, information technology, pain management, and geriatrics at the University of Pittsburgh developed the module, focusing on common errors in clinical exams, expert modeling, interactivity, and feedback. The module presented a standardized case of an elderly back pain patient called Edna, with brief video clips that showed her interacting with her clinician. The module also contains a multiple choice pre-test, interactive questions, and a multiple choice post-test. Twenty-seven medical students were exposed to the module and 28 were not. The students in the group exposed to the module did significantly better on their objective structured clinical examinations, an exam during which medical students rotate through multiple stations, each with an objective examiner, demonstrating clinical skills and knowledge while interviewing real or simulated patients. Ninety-three percent of the students in the exposed group passed the exam, compared to 60 percent of the non-exposed group.